When there is a new fix or update released for a product I am working with frequently, I always like to read the release notes to see what has been fixed or what kind of new features has been added. This helps in calculating what kind of impact the fix\update will have when installing it in a environment. It frustrates me when there is new functionality added that is not listed in the release notes, and to make it worse when a production environment is suffering because of this. When one of the above is installed, you will likely see popups when opening Internet Explorer to allow this BHO and its components to load outside of Internet Explorer protected mode. If you were lucky you spot this popup when going through a test procedure, but if Internet Explorer was not on your test list you will get a lot of calls to the support desk from frustrated users. Ok so it’s not used for the majority of customers running XenApp or XenDesktop, only by certain XenApp Cloud Service Providers… Why is it (already) added to a public release of Receiver and a public release of a XenApp hotfix with so less information provided? 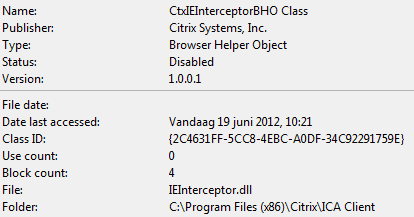 Since there is so little information about this BHO, I now choose to disable this add-ons entirely till there is more information about it from Citrix. 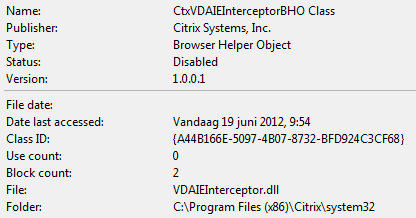 The BHO add-ons can easily be disabled through a group policy see this CTX KB for more details on how to do this. In this way it’s easy to enable the add-on again when Citrix comes with more information about the BHO and you decide you want to use it. 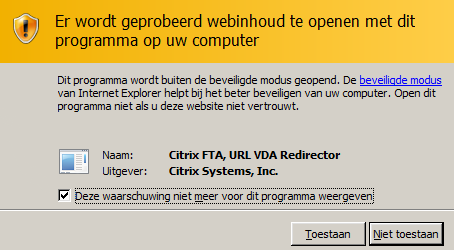 In a previous blog I wrote a workaround to get rid of the annoying popup in IE and enable the BHO and its components for everybody, but for now I would advise to disable the Citrix BHO entirely till Citrix comes with more information about it. If someone has additional information about the interceptor BHO please let me know.